Titan V5. 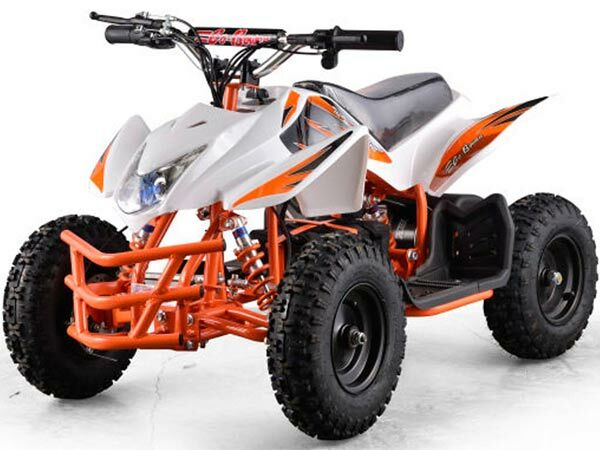 Latest Mini Quad From Moto Tec. Moto Tec Titan Version 5 Mini Quad. Comes in four popular colors. Black, White, Pink and Oak Camo. 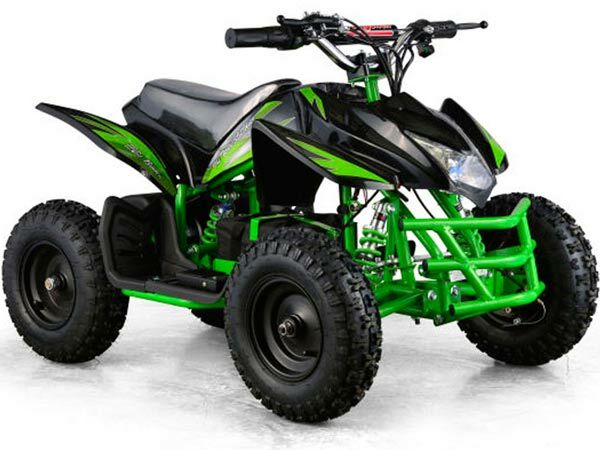 This battery power kids quad accommodates young riders up to 150 pounds. 350 watt 24 (2 battery) system. Moto Tec V5 Mini Quad is loaded with safety features that helps to keep younger riders safer without interfering with rider enjoyment. Operates and handles much like the larger adult quads. No noise. No fumes. Quiet,, neighborhood and campsite friendly. Built with Moto Tec quality for years of service. 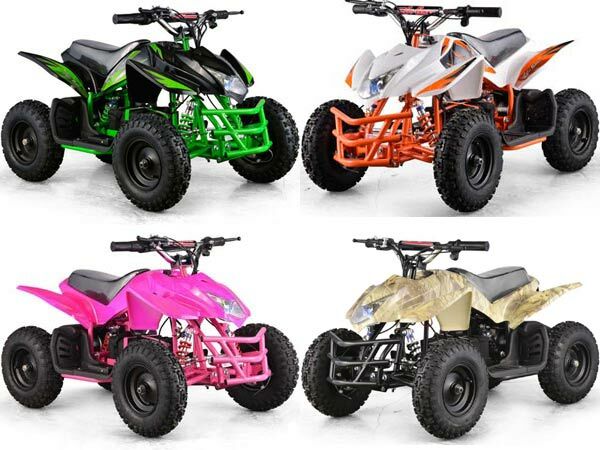 V5 Titan kids quad features the sport quad styling that your child will love. Real BMX style handlebars. Most popular colors. Two speeds 5 mph or 10 mph. Speed setting is selected by key for parental control. Power On/Off is controlled by key to discourage unauthorized use. Moto Tec V5 Mini Quad's body is strong ABS type material that flexes to help absorb minor bumps and bruises. BMX style handlebars with cross tube pad. Seat is padded (single rider). Battery charge level indicator on handlebars. 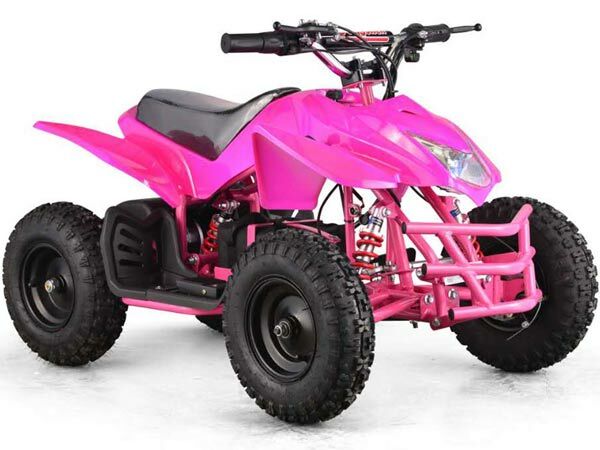 Powerful 350 watt motor delivers the "real quad experience" to your child. Two larger 12 volt, 12 amp hour, sealed batteries supply the power for the Moto Tec V5 Kids Mini Quad. Built on an all tubular steel frame the platform for the Moto Tec V5 Mini Quad is stronger for extended life. Front independent suspension uses coil over shocks. Rear suspension uses single center shock. Large 13 inch tall, off road, air filled, rubber tires. Front brakes are disk with vented rotors. Rear break is disk on axle. Rear brake also serves as parking break. Moto Tec V5 Mini Quad delivers the best rider experience for your child. 12 amp hour batteries for longer ride times. Full suspension just like an adult size quad. Bright headlamp so the fun doesn't have to stop. Easy, child friendly controls. The Moto Tec V5 Mini Quad makes an excellent gift idea for any occasion. Colors or trim design may very from images used on this site. Speed, climbing ability and range depend on rider's weight, terrain, tire pressure.and other factors. 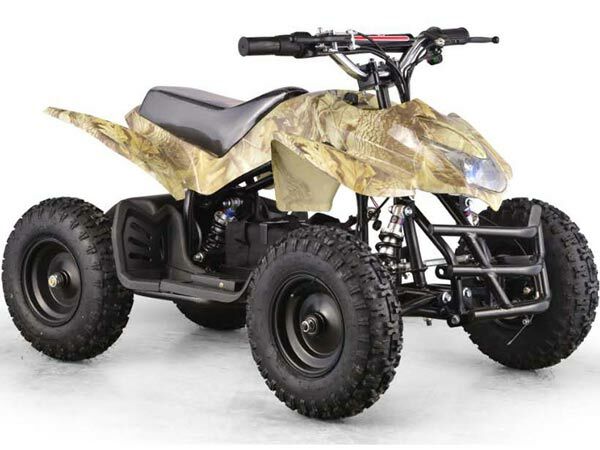 Click the button below to add the MotoTec 24v Mini Quad Titan v5 to your wish list.